Starting from as low as $999 to move from Miami to Jacksonville (or moving from Jacksonville to Miami). Only Straight deliveries. No waiting! Easy Florida Moving is a well-known relocation company that provides not only long-distance moving solutions but local moving as well. If you are moving from Miami to Jacksonville, FL, or any other destination, do not hesitate to contact us for our top-quality, professional relocation service. We are great at what we do, and let us explain why. As we stated above, we offer long, local, commercial and residential moving solutions, with a comprehensive package of services. We can say that we take control of your move from start to finish. Our services are including, but not limited to: loading, unloading, assembling, disassembling furniture, labeling, and taking care of fragile items. Also, if you think that your office or home is not ready for our drop-off, we can store your items for you for as long as you like. This is a very convenient feature for those, whose house or office is being remodeled, or renovated. When you are trying to move a safe from Miami to Jacksonville, Easy Florida Moving knows the deal. Specialty items require a certain type of packing, the right weather conditions and knowledgeable team of movers that know what they are doing. Our Miami packers take care of the little details, check the weather report, have all the packing materials on hand and are ready to take your specialty items safely from your next location. 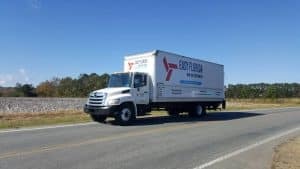 Get ready to read about the benefits of hiring Easy Florida Moving for your next move from Jacksonville to Miami, Florida. After hearing about our ambitious team of movers, you will make the right decision. The professional team of Easy Florida Moving Customer Service team and packers are known for their friendly attitude, responsibility, and trustworthiness. We always answer your calls and keep you informed throughout the moving process. Our transportation and packing materials are beyond your expectations. We want to show you that we care about the smallest details. Every recommendation and inquiry you give to us will be taken very seriously. Your ideas and handle instructions matter to us. When we say that we will charge you a certain Flat Rate Fee, it will be the same from beginning to the end. At Easy Florida Moving, we practice honesty, integrity and utmost respect for you and your budget. When you are moving from Miami to Jacksonville, FL, be sure that your valuables will be safe. Our packers make moving seem like an easy process. When you have a team of movers that pay such an attention to detail, care about your household or office, everything about relocation will seem unchallenging to you. Call our amazing team of professionals – we would love to tell you much more about our capable and knowledgeable movers. We would love to provide you an honest, affordable, and free quote on your next move. Easy Florida Moving should be your next Miami to Jacksonville mover!